What is this called and why does the top one look "correct" and the bottom one "incorrect"? It's called "Stress" and it's a remnant from when letters where hand-written by calligraphers and not yet printed by press. The answer is really rather simple, and hails from the pre-printing days when books where still written by hand. During these times a tool called a calligraphy pen was used to produce hand-written volumes. These pens had a flat tip that resulted in a trademark thick-thin transition when the pen was angled a certain way. After the printing press was invented by Gutenberg, letters were no longer written by hand with calligraphy pens. Instead, they were cast into metal representations of the letters that with ink could be used to ‘press’ the letters onto paper in an instant. To give the ‘printed’ books the same authentic look as the hand-written volumes, the metal cast ‘letters’ used by the printing press were styled after the hand-written letters seen in volumes written with calligraphy pens. Thus, the thick-thin transition of stress is really just a throw-back to the days when books were written by hand. Serif typefaces originated from carvings in stone in Roman antiquity. The variation in thickness of the lines (or line contrast) and the angle that the thickness changes (the stress) comes from how the letters were carved in to the stone with a chisel. Serif typefaces can be grouped in to a number of classifications that, amongst other things, have different stresses and line contrasts. These typefaces date back to the beginning of the printing press and movable type. 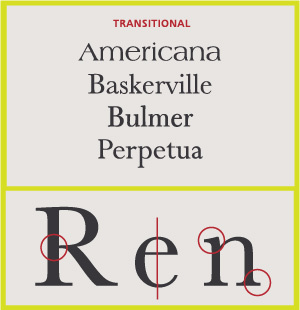 The contrast in thick and thin strokes is typically less than in later designed typefaces. Old style serif fonts have remained popular for setting body text because of their excellent readability on book paper. English printer and typographer John Baskerville established this style in the mid 18th century. [...] improved printing methods allowed much finer character strokes to be reproduced and subtler character shapes to be maintained. While the axis of curve strokes can be inclined in transitional designs, the strokes normally have a vertical stress. 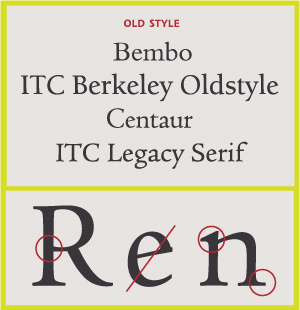 Weight contrast is more pronounced than in old style designs. The contrast in thin and thick strokes in Modern serifs is much more extreme and with a vertical stress. This typically makes Modern serifs less suited (although not unseen) for body text and were therefore some of the earliest 'Display' typefaces. Stroke modulation is how much the thickness of the stroke changes in different parts of the letter. In traditional calligraphy, the brush pen is held at a constant angle as the letters are drawn, creating a stroke with a lot of modulation. In more mechanical typefaces, modulation is often really low but our eyes are so accustomed to it, that even typefaces with little perceptible modulation are actually subtly modulated. Modulation means the usually cyclical and predictable variation in width of the stroke. In unmodulated letterforms, such as Helvetica, the stroke is always fundamentally the same width. In a Renaissance face such as Bembo or Garamond, the stroke is based on the trace of a broad nib pen, which makes thin cross strokes and thicker pull strokes. When letters are written with such an instrument, modulation automatically occurs. Not the answer you're looking for? Browse other questions tagged typography typefaces terminology or ask your own question. When are typefaces considered conflicting with each other?